This month was my pick. And I selected Babette's Feast. I watched the movie years ago...back in my Isak Dinesen-obsessed days. A Danish friend had introduced me to her books when we were both living in Italy, so I read these Danish-penned novels in Italian translation. Then, when I moved home, I bought the books and read them again in English! If you’ve never seen “Babette’s Feast,” you must. Really. It's based on the short story by Isak Dinesen and illustrates the transformational power of food. It is also a foodie's dream movie, a magnificent celebration of haute cuisine. 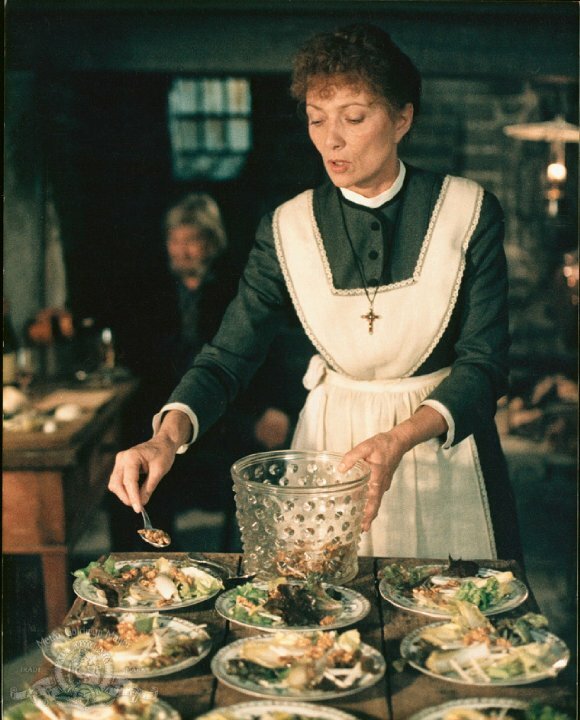 In 1987 Babette’s Feast won an Oscar - the first Danish film to win one. Director Gabriel Axel’s screenplay and film is remarkably true to Dinesen’s original story, with added emphasis on the preparation and consumption of Babette’s magnificent meal. So wonderful. I watched it again last week when the house was quiet and all my boys were asleep. And I pulled out a notepad and scribbled down the dishes from her feast. What should I attempt? Do any of these look good to you? What are you inspired to make? 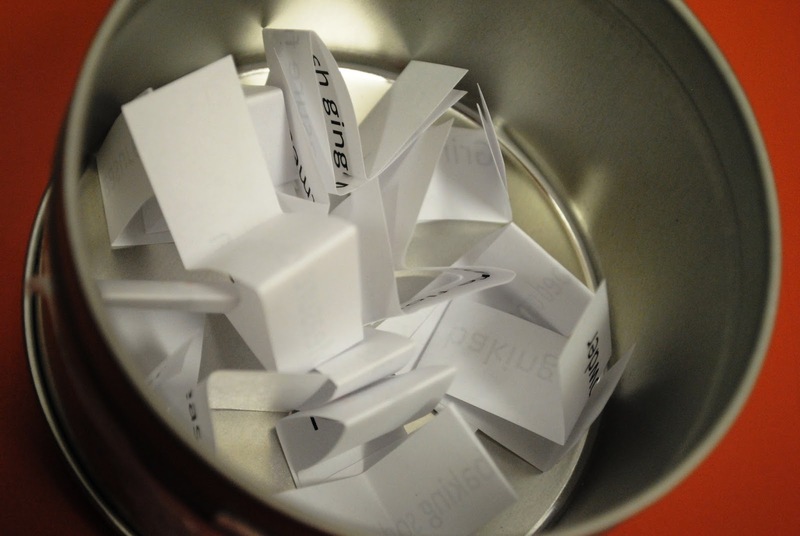 *watch for the roundup to be posted by February 28th! One of the reasons I teach Friday enrichment classes: I learn things as I research for the kids. This class, I learned that what we typically call 'cinnamon' isn't real cinnamon. 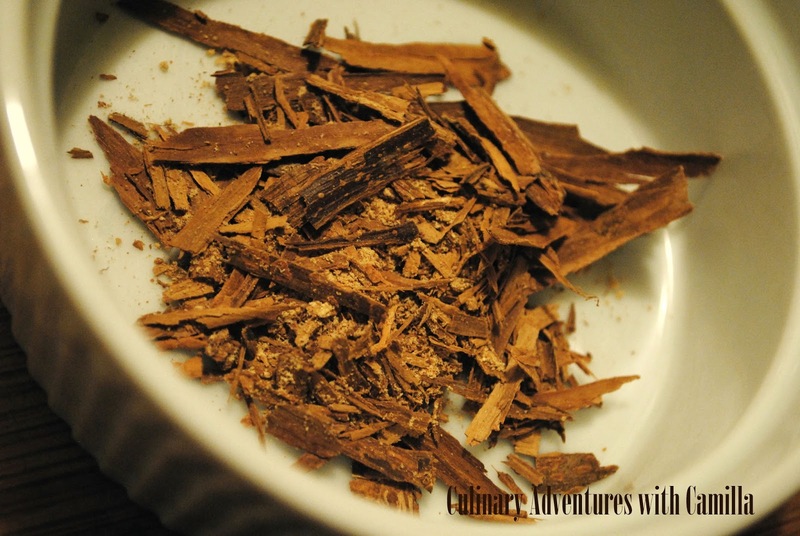 Cinnamon is a spice obtained from the inner bark of several trees and used in both sweet and savory dishes. Cassia cassia is often sold as Chinese cinnamon. I can say, from grating it today with the kiddos, there is a difference. Wow. 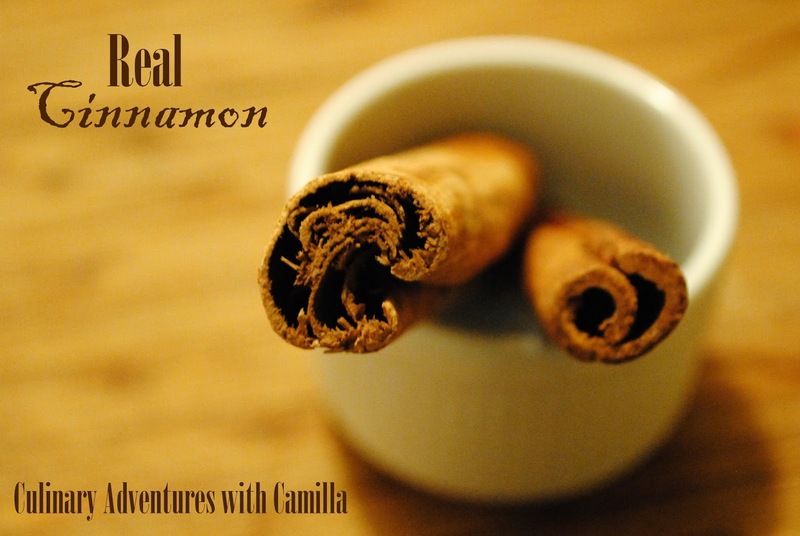 I will be tracking down real cinnamon from now on. I bought mine from The Savory Spice Shop. 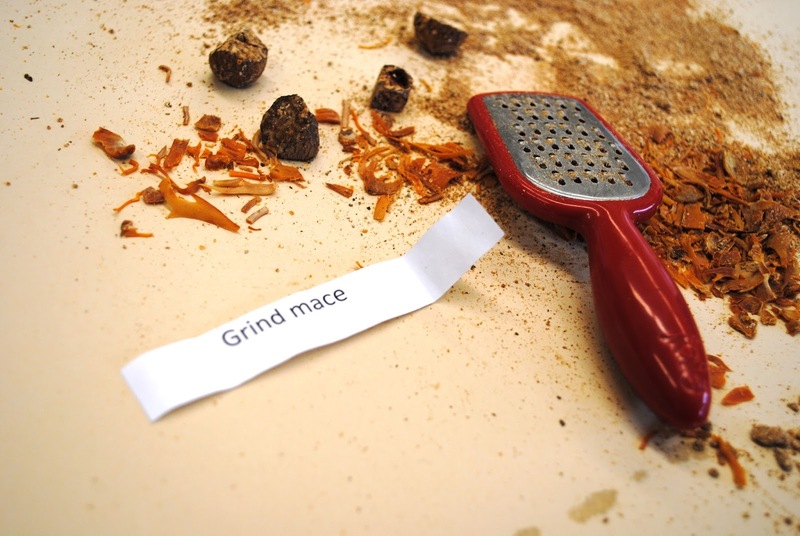 Since today kicks off the Chinese Lunar Year of the Horse, we blended our own Chinese Five Spice. I cheated...and I had Jake grill the chicken for me ahead of time. Double cheating! But my Spice It Up! class is five minutes shorter today due to an earthquake drill, so I can use all the help I can get. In China, Japan and other Asian countries, it’s customary to eat long noodles, signifying longevity, on New Year’s Day. Since the noodles are never to be broken or shortened during the cooking process, I decided to go with a stir-fried “Long-Life Noodles” dish. Combine all ingredients except chicken, and use as marinade. Then, marinate chicken at least an hour, but can marinate overnight. Bake in a 375 F. oven, basting once or twice, for about 45 minutes or grill until done. 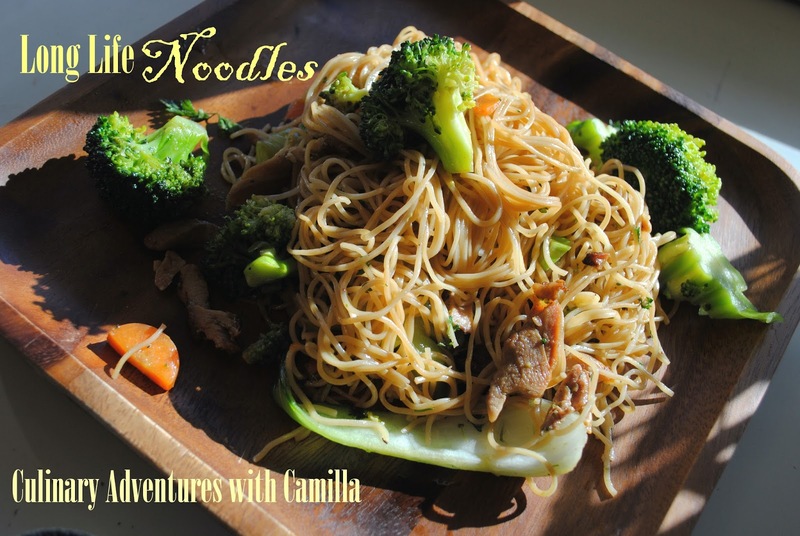 I made this ahead of time and tossed them into the stir-fry at the end to warm them up. Prepare noodles according to the package direction. The ones we used needed to be par-boiled for 3 minutes before being tossed into the stir-fry. Toss with oil after cooking to prevent them from sticking to each other. Brown the garlic in a splash of olive oil until fragrant. Add in the greens, broccoli, and carrots and cook quickly – you still want them slightly crisp. Stir in the cooked noodles, slices of chicken; add another splash of olive oil, a splash of soy sauce, and a splash of sesame oil. Toss to coat completely. You want them glossy. Garnish with fresh cilantro. 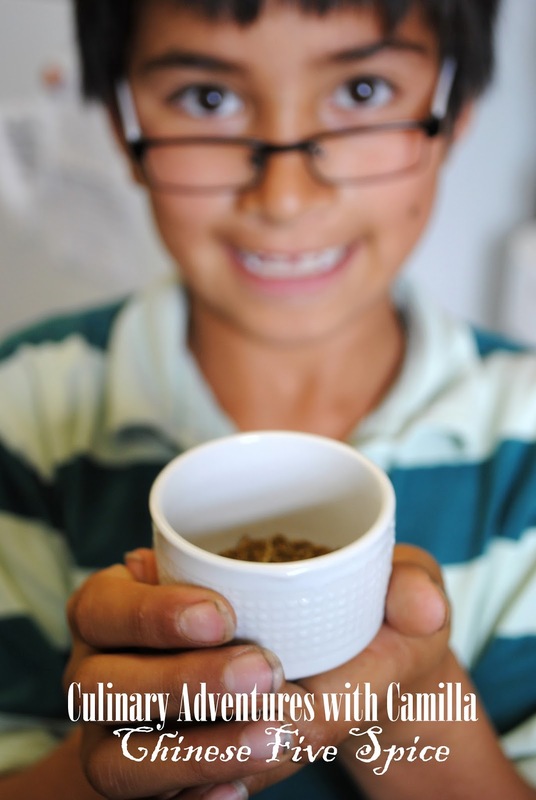 While I took a shortcut, the kids ground and blended their own Chinese Five Spice today in our Spice it Up! class. First I had them smell the blend and see what scents they could discern. Then we let the spices fly! I swapped lesson plans for this week's Spice it Up! class. I had originally planned a tabletop jaunt to Provençe, but realized that Chinese Five Spice was much more appropriate. I can't believe I almost missed that it's Chinese New Year. The year of the horse begins today. Perfect. 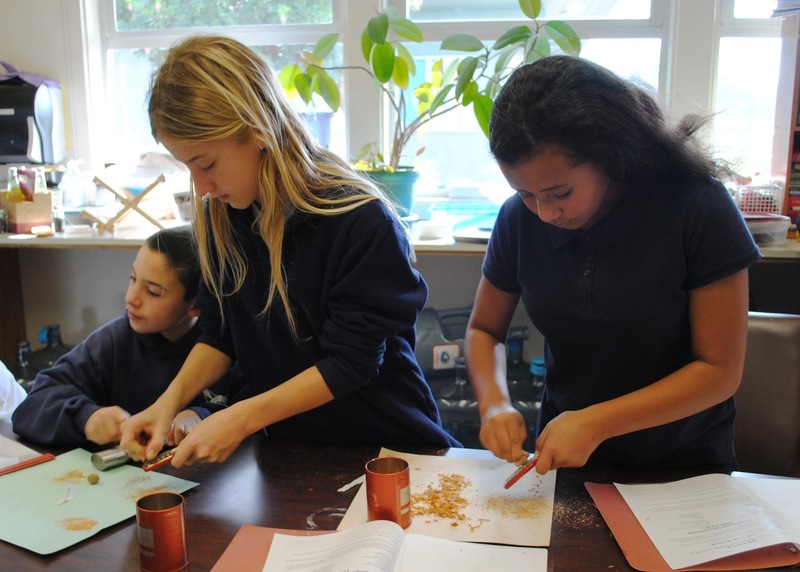 We're grinding and mixing our own Chinese Five-Spice in class and making noodles! 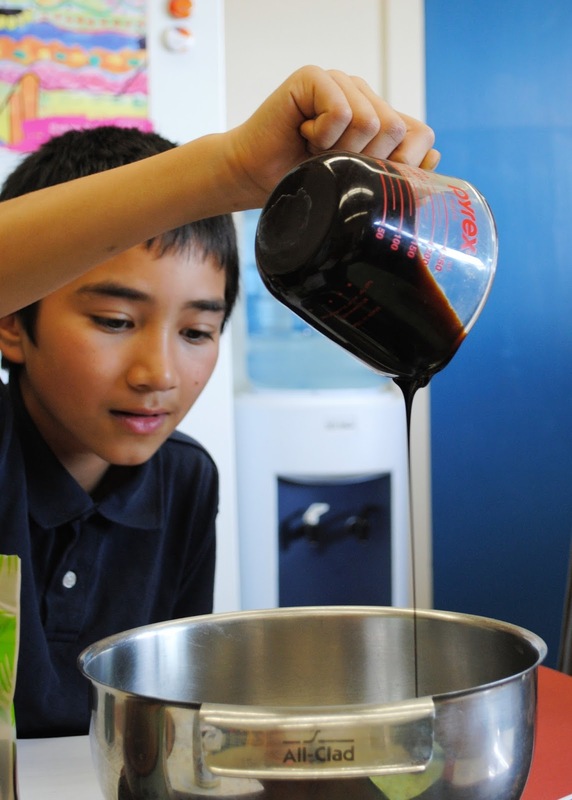 Truth be told: the kiddos are grinding and mixing their own today. Me? I cheated. Teachers get to use shortcuts, right? I picked this up at Whole Foods and used it on the chicken for the Long Life Noodles. Recipe to come. Do you grind and blend your own spices? I love it...when I'm not pressed for time. 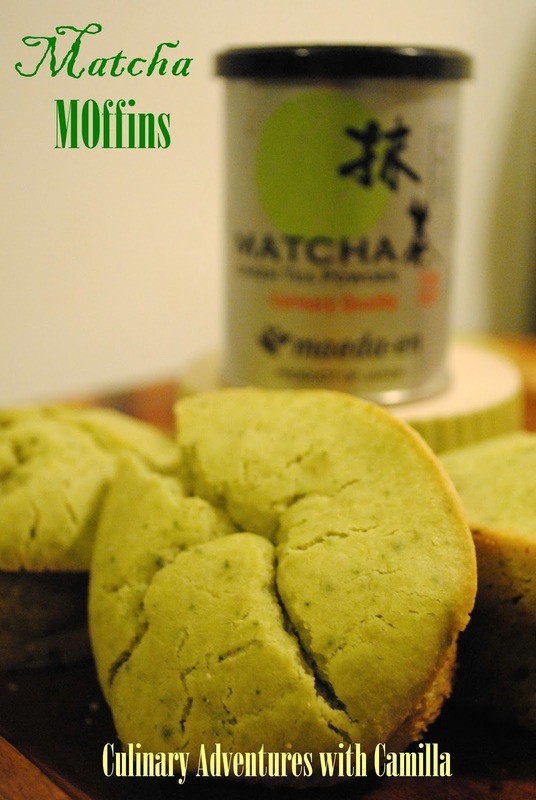 Back when I was looking for a cookie to send for The Great Food Blogger Cookie Swap 2013, I ended up making Matcha-Black Sesame Shortbreads...after a little inspirational gift - the matcha - from a friend whose family owns a sushi deli. I've been slowly working my way through the canister and used the last bit of it this morning. I love the delicate color and the subtle flavor. Gotta get my hands on more matcha soon. 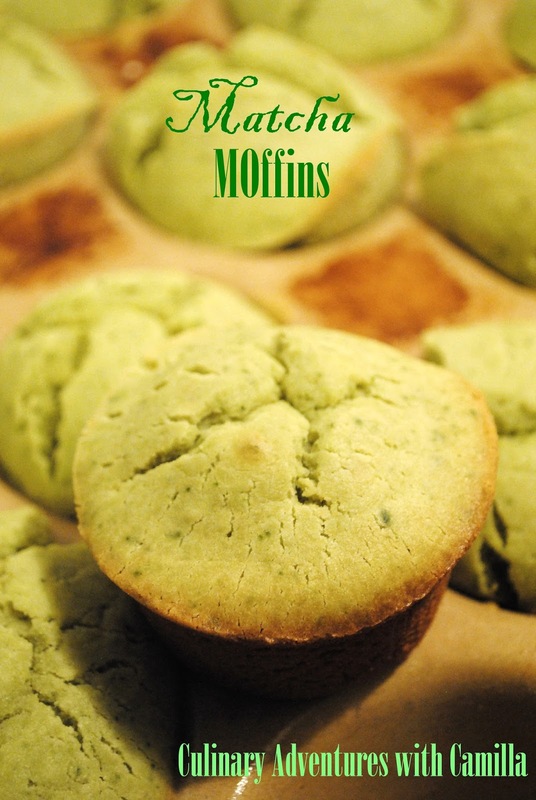 MOffin = mochiko (sweet rice flour) + muffin. This makes for a quick and portable breakfast. I served these with some yogurt and blueberries. Fast and tasty! Mix the eggs and oil. Then mix in everything else until just moistened. Spoon the batter into greased muffin hollow. 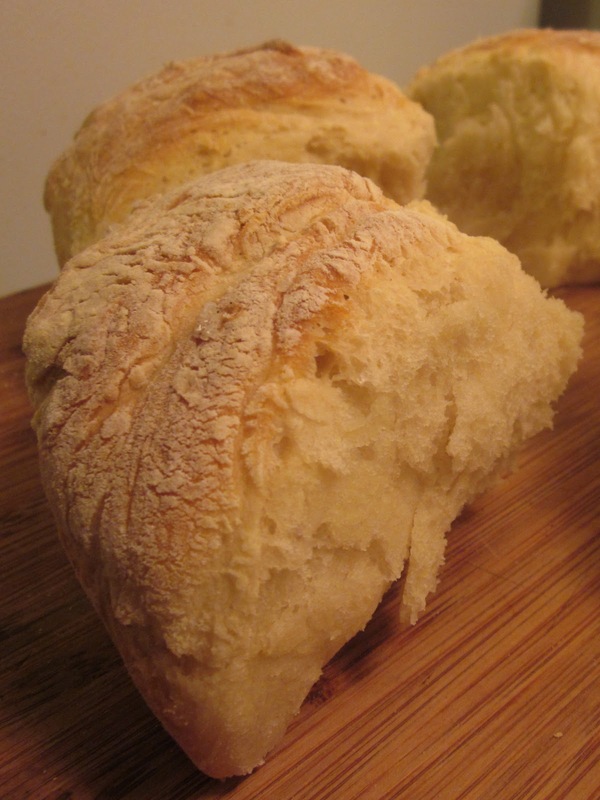 Bake for about 30 minutes at 375˚F till the top of the MOffin is slightly browned and slightly cracked. Let cool for 5 minutes before turning the MOffins onto a cooling rack. Do you love Valentines' Day? I don't...I am not one to celebrate Valentines' Day, typically, for myself. I firmly believe that love and romance belong front and center all the time. Why is February 14th designated as a day for people to show their sweethearts that they are adored? What about the other 364 days?!? I would rather get a bunch of handpicked wildflowers on a random day in January than a dozen red roses on a day when florists mark up beyond the usual 300% markup on flowers anyway. Okay, I know that I sound unapologetically unromantic. Is there a Valentines' equivalent of a Grinch? That would be me. But one of my boys loves Valentines' Day and spends weeks planning his cards for his classmates; the other could take it or leave it, but definitely likes the treats. 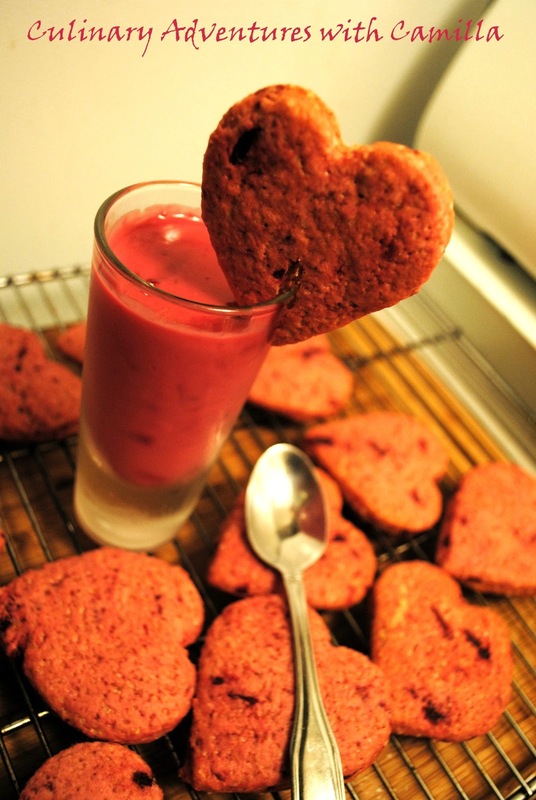 These were some heart-shaped treats we made last year: Beet Sugar Cookies. So, with that in mind, I decided that my February linky theme would be sweet treats...for your spouse, for your kiddos, for the kids' classmates. Whoever. 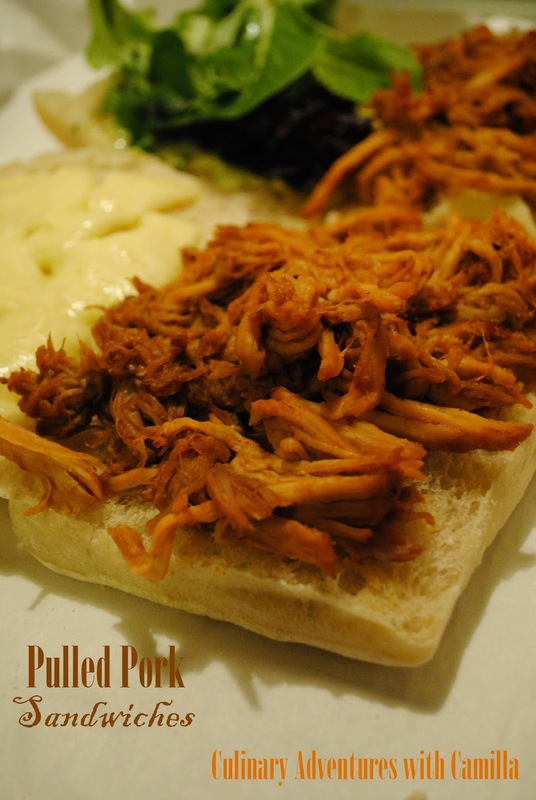 I don't know why a pulled pork sandwich popped into my head last night. But I had a 3 lb pork loin roast in the fridge and decided to give it a shot. 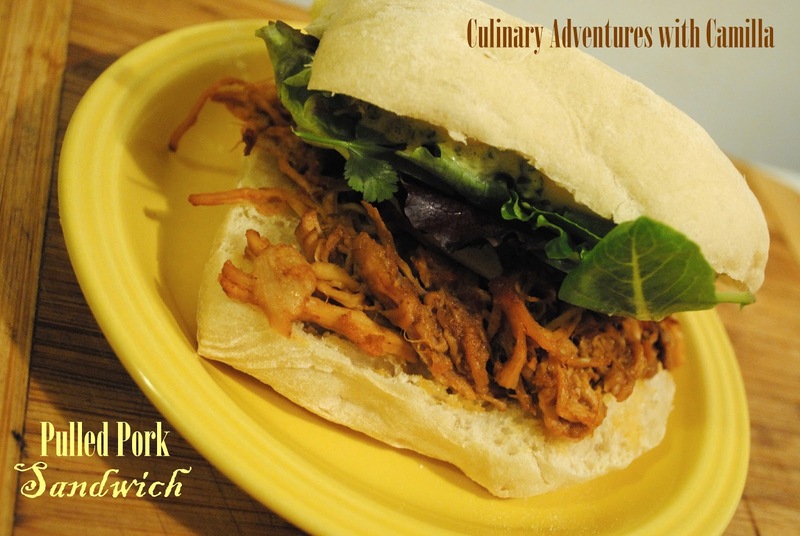 Never having made pulled pork, I did some reading; unfortunately, almost all of the recipes said to do it in a crock pot...and I do not own a crock pot. I thought about braising it as I've had fantastic success with melt-in-your-mouth-tender lamb and beef. Then I remembered when I made Wild Boar Rillettes and opted for that process: slow-roasted in the oven. Preheat the oven to 250 degrees F. Rub the pork with the brown sugar and spices, taking care to coat as much of the surface as possible. I didn't measure the salt or pepper, but it was, probably, about 5-6 grinds of each. Place the meat in a baking dish and pour the vinegar over the meat. Drizzle with a splace of olive oil. Cover with foil and roast for 4 hours. Remove from heat and let cool for about 10 minutes before using two forks and pulling the meat apart. This should happen very easily. I shredded the meat in the roasting pan, letting the meat soak up the cooking juice, then, I stirred in 1/2 C homemade ketchup and let cool completely before sticking it in the fridge for tonight's dinner. Warm the meat in a pan with a splash of water - or you can use a microwave, I just don't have one. Slice open your rolls or lay your bread on a parchment-lined baking sheet. Lay the meat on one half and sliced cheese on the other. Heat in a 250 degree F oven until the cheese is melted. Smear some aoili on the cheese, layer with lettuce, and serve. Fastest Monday night dinner in the history of my kitchen! Love it. 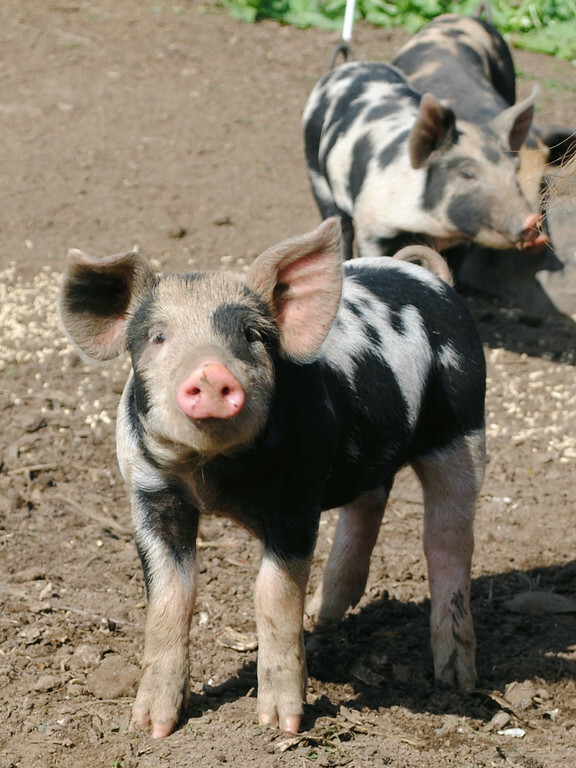 Visiting our CSA farm, he spotted a sow with a row of piglets. “No, silly Mommy. They’re for bacon… or ham!” he declared. Throughout the year I participate in events that span the blogosphere. It might be for a cause, such as the Cookies for Kids Cookie Swap I do around the holidays; it might just be for fun, such as a Pepper Party. But I stumbled on this event - the Food Blogger Cookbook Swap cohosted by Alyssa of Everyday Maven and Faith of An Edible Mosaic - and signed up immediately. Geniuses both, I tell you.I can not wait to participate! So, I am tickled that I get to package up a cookbook and swap it with another foodie blogger. Another great thing about this: I get to meet some new-to-me bloggers. Rose at Avocado Bravado; Hannah at Blue Kale Road; Cucina Kristina; Kitchen Treaty; and Kellie at the Suburban Soapbox - nice to meet you! And it's always nice to see some old friends: Heather at girlichef; Carrie at Poet in the Pantry; Dorothy at Shockingly Delicious; and more. It's always a pleasure to be part of projects with you all. If you want to join the fun, click for more information here. The sign-up deadline is this week. You still have time! Now I just need to wait for my assignment, peruse the blog, and pick a good book from my shelf. I made this for my Spice It Up! kiddos on the first week. I guess I forgot to post it. I just remembered when I made another version this weekend. The secret to homemade lemonade is to make a simple syrup first. That way the sugar is dissolved and not grainy in your drink. The ratio for the syrup is 1: 1. For this version I added sprigs of rosemary and thyme to the syrup as it cooled. 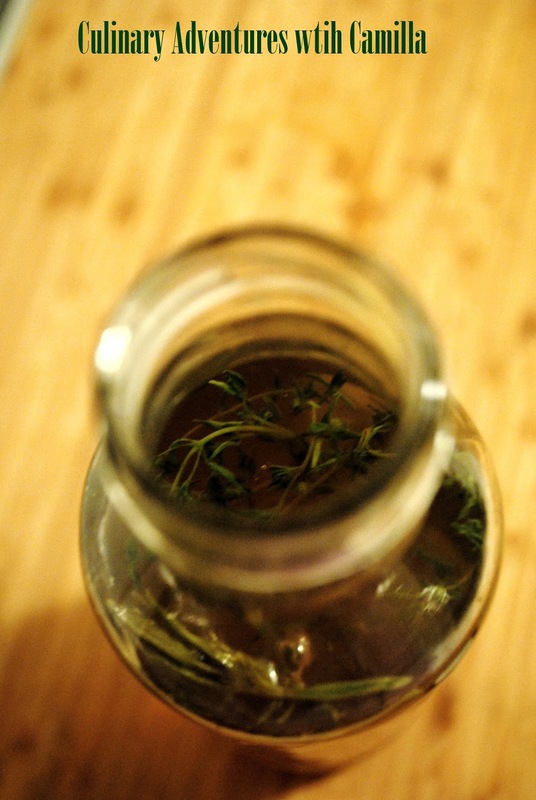 Place herbs in a jar or bottle that can hold up to 2 cups. Put the sugar and water into a saucepan and simmer over medium heat till the sugar is completely dissolved. Pour the syrup over the herbs and let cool. Reserve the syrup till you’re ready to make the lemonade. Pour syrup into a mixing pitcher. Add 1 C freshly squeezed lemon juice. Then add water to taste, usually another 5-6 C of water. If you want, you can substitute sparkling water to make this bubbly. Serve with slices of fresh lemon and herb sprigs, if you like. 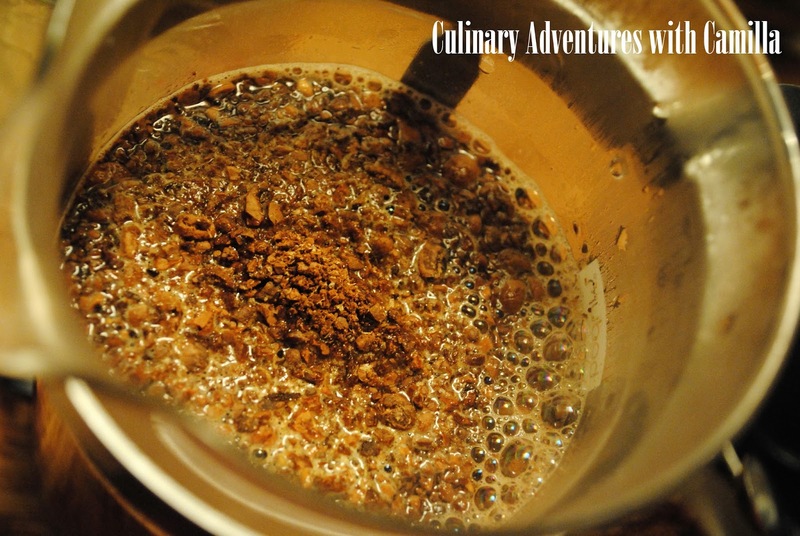 *NOTE: coconut sugar is a dark brown color. So the resulting lemonade isn't your typical clear-yellow beverage. If you want that color, use granulated sugar. 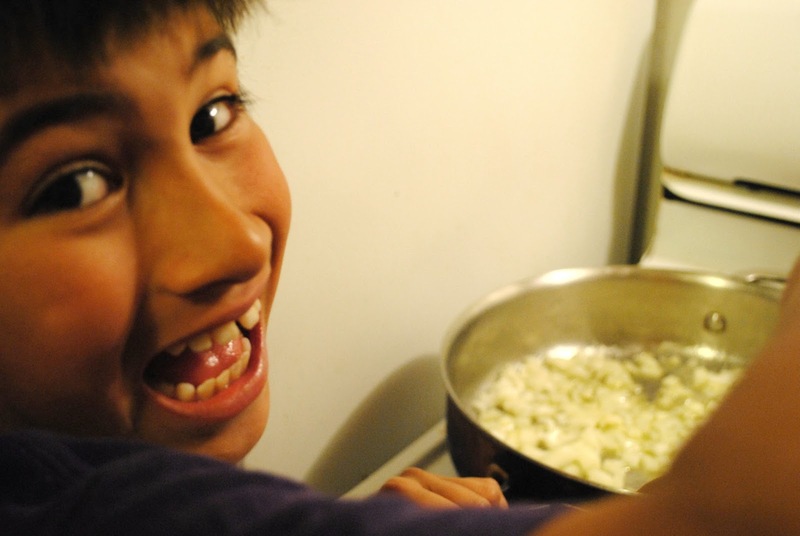 Every so often, the boys ask if I can teach them how to make something. D recently requested saffron rice. Sure thing! This may not be a traditional recipe, but it's tasty. 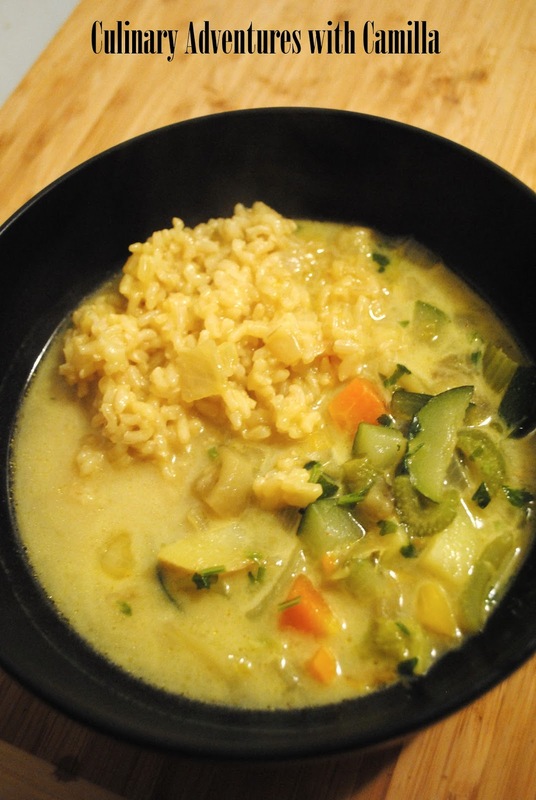 He also whipped up a curried veggie soup to go with it. Soak the rice in cold water for half an hour or so. Soak your saffron threads in 2 T of boiling water. In a large flat-bottom pan, melt the butter in a splash of olive oil. Add the spices - cardamom, cloves, and cinnamon - and fry for about 5 minutes, stirring occasionally. They'll begin to let off an amazing aroma! Add in the onion and cook, stirring occasionally, until golden brown. Stir in the rice, coating them completely with the butter and oil. Cook over low heat for about 5 minutes. Pour in the boiling broth, then, stir in the salt and saffron. Cover and simmer until the rice is cooked and the liquid is absorbed. It'll probably take about 40 minutes. 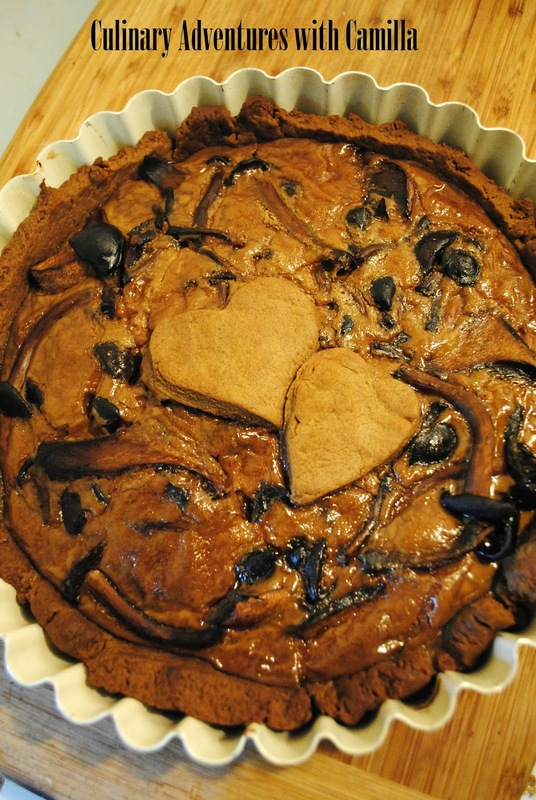 With my Mushroom-Honningkage Tart in the garbage, Riley said he wanted to make dessert last night. 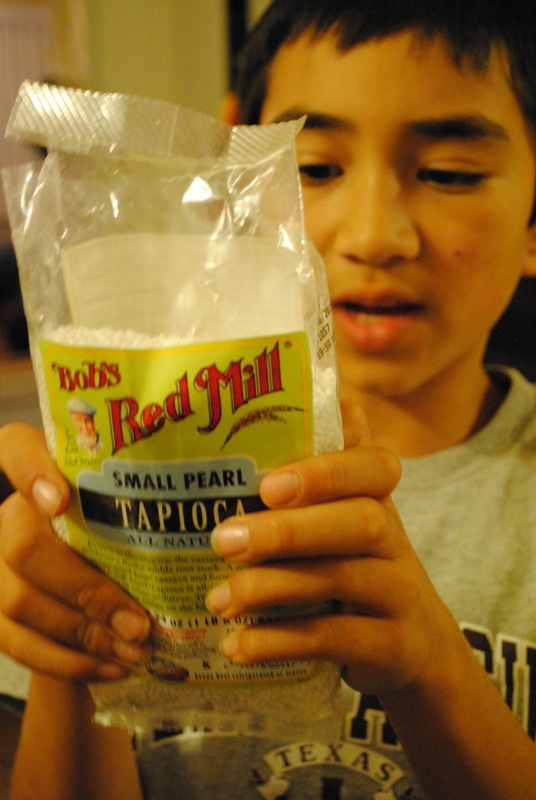 His pick: homemade tapioca. 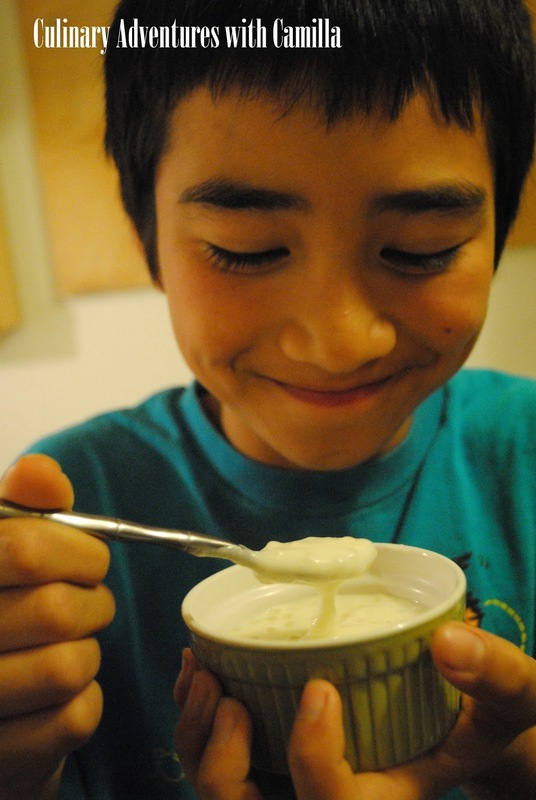 I can't say that I've ever made tapioca, but Riley has - at my parents' house - and was confident. And because he is the Precise Kitchen Elf, I just left the kitchen and let him go at it. 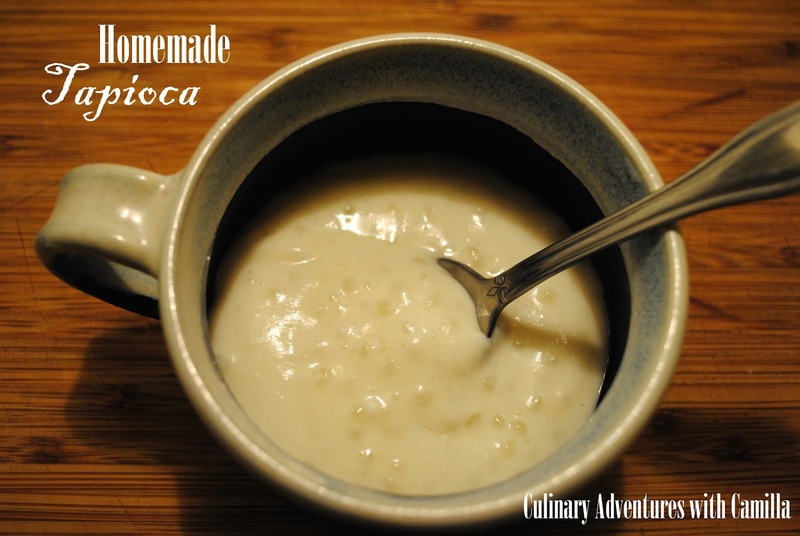 Soak tapioca pearls in cool water for at least 30 minutes in medium saucepan. We ended up soaking for abot 45 minutes because I had to run to the store for eggs. Do not drain. Add milk, fleur de sel, 1/4 C sugar and beaten egg yolks to the tapioca pearls and stir over medium heat until it boils. Simmer over very low heat for 10-15 minutes, stirring often. You'll see the pearls turn clear and the mixture thicken to a custard. Beat the egg whites with remaining 1/4 C sugar till soft peaks form. Fold 1/2 C of the hot tapioca mixture into the egg whites, then gently fold mixture back into saucepan. Return to the heat and stir for about 3 minutes. Cool for 15 minutes then fold in the vanilla extract. Serve warm or chilled. Thanks for saving dessert, kiddo! Let me preface this by admitting that Jake - my husband and self-professed sugar pig - did not eat this. Well, he tasted it, but he didn't finish his slice. He couldn't. That says something. Remember, I said 'sugar pig.' He'd eat dessert everyday if I made it. His conclusion: mushrooms should only be savory. Okay, that's it. If you're still with me, it is an interesting story. 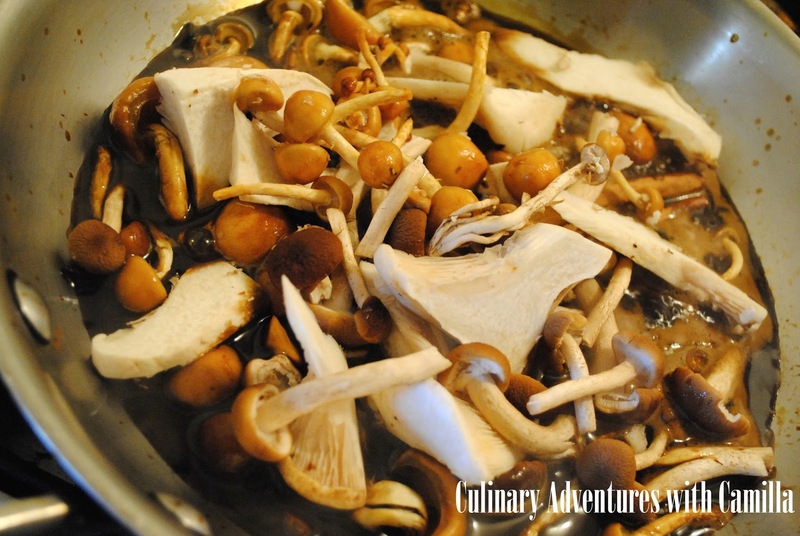 This month, I hosted a round-up of mushroom-based recipes from some of my favorite bloggers: Fun with Fungi. Lots and lots of savory mushroom goodness. I had intended to make a mushroom dessert, but didn't get the chance before posting the round-up. So, today I gave it a shot. Mushrooms in a dessert?!? Well, I was determined to create one. 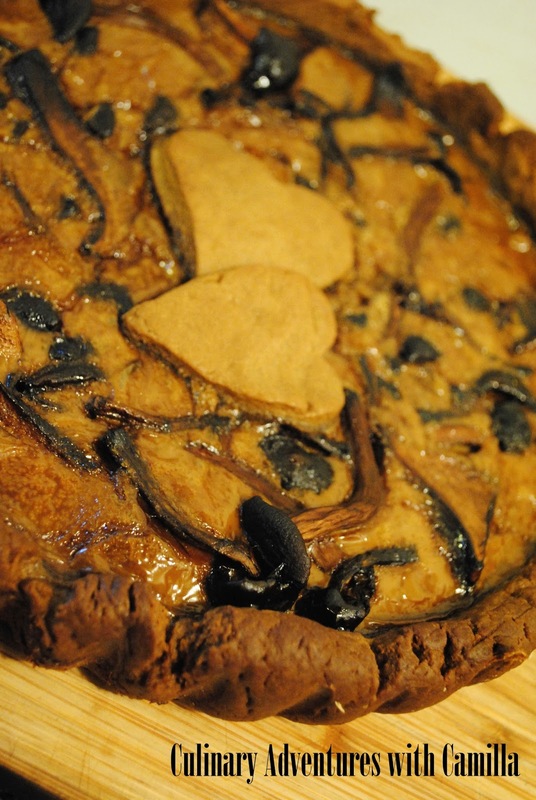 I found inspiration in this Sweet Forest Namenko Custard Tart from the Gourmet Mushrooms, Inc. So I used the leftover Honningkagehjerter dough as the crust. 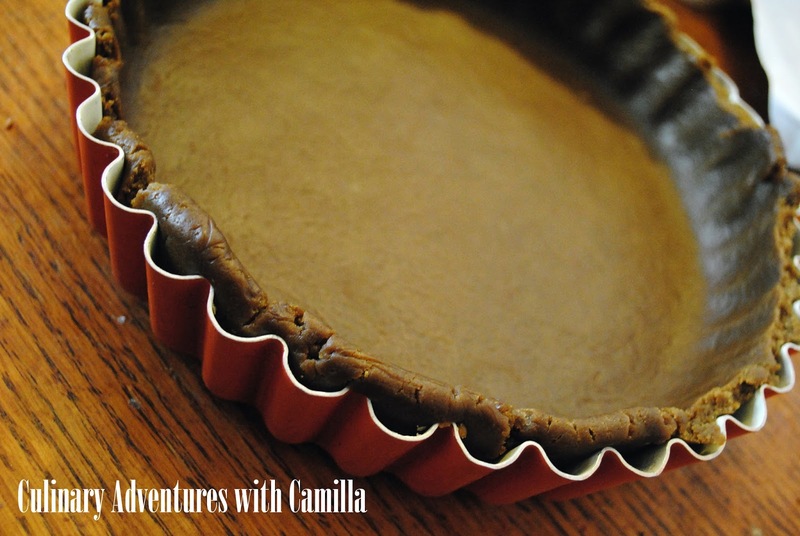 I rolled it out, pressed it into a tart pan, and baked it in a 370 degree F oven for 15 minutes. 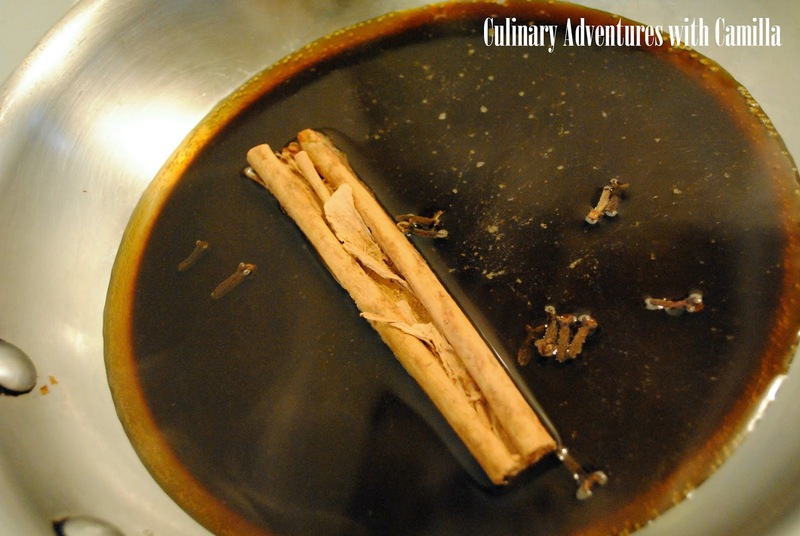 Make a poaching liquid with the molasses, water, and spices. Bring it all to a simmer in a large sauce pan. 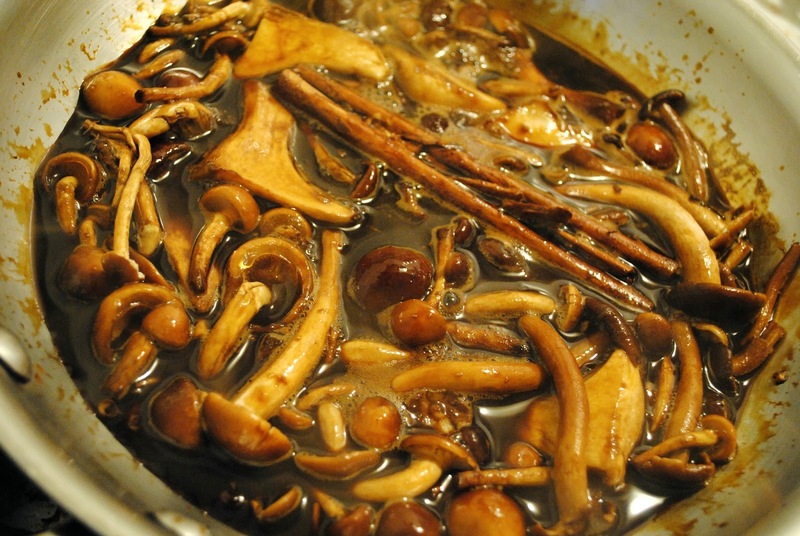 Slice the larger mushrooms and stir them all into the poaching liquid. Stir to coat and simmer until they are softened. Then strain out the liquid and remove the spices. Preheat the oven to 375 degrees F. Whisk the cream, yolks, and poaching liquid together. 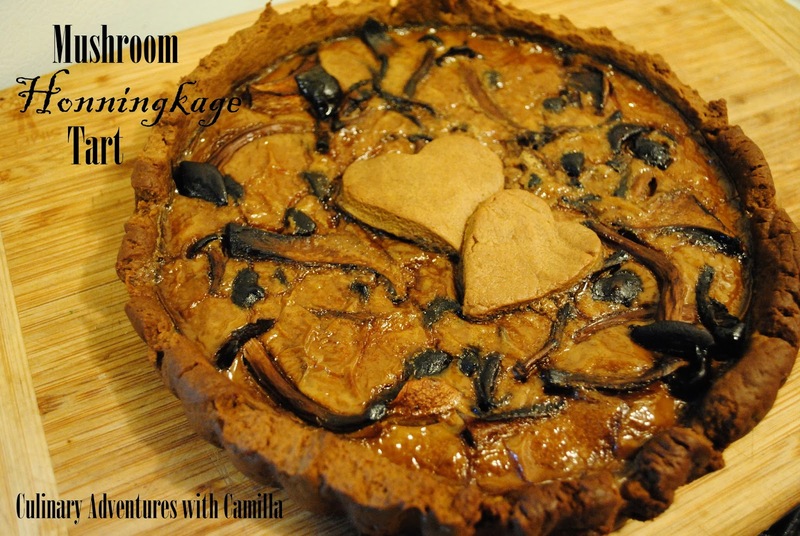 Lay the mushrooms in the baked Honningkage crust. Pour the custard over the mushrooms. And bake till it's set, probably 30-35 minutes. Gotta say, I loved the way this looked. One bite in, though, I agree with Jake. Mushrooms do not belong in a dessert. They were slimy. Yuck. 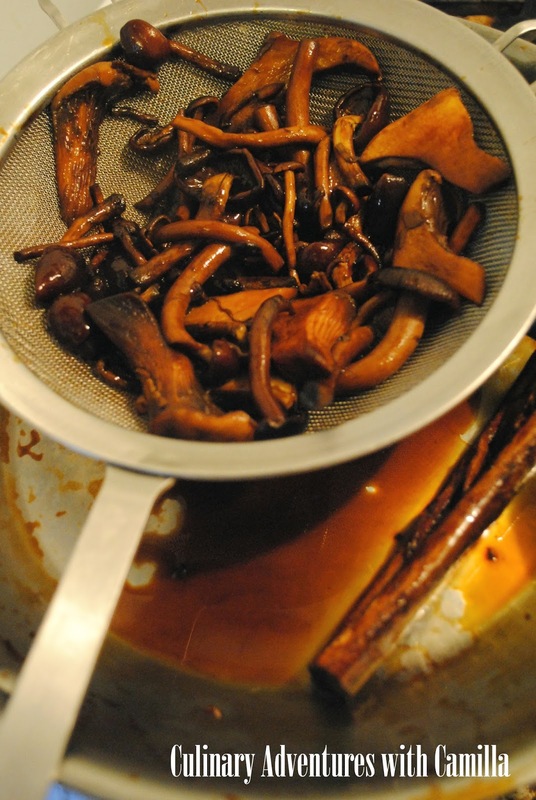 Well, I think I might be able to grind some dried mushrooms and make macarons. But this is a never-again. Floppity flop flop flop! I originally found a recipe for Cullen Skink when I was researching nutmeg recipes for my Spice It Up! class. But, looking at timing - only an 85 minute class - was not enough to do it justice. So, I skipped it for the dozen kiddos and made it for my family for dinner with Salt Bread. 'Red book worthy!' it was declared by two of Mann boys, after the first taste. It was the big one and the middle one, in case you were wondering; the little one reserved judgment. And I have say, it was tasty. Anyway...to the recipe...because this soup is amazingly delicious! 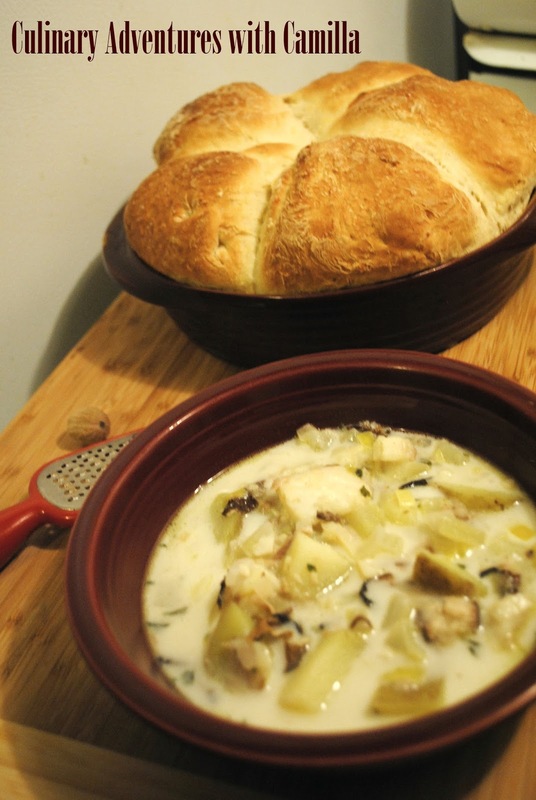 The name of this rich soup comes from the fishing village of Cullen, in Northern Scotland. 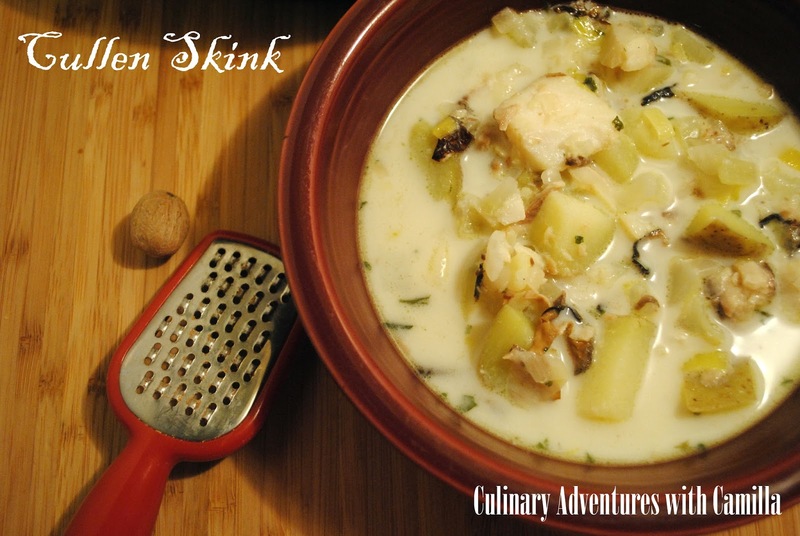 "Skink" is a soup made originally from a shin of beef; it is sometimes called Smoked Haddock Chowder. Heat oil in a large soup pot and gently fry the leeks, fennel, onion, and shallots in a pat of butter and a splash of olive oil. Add the potatoes to the pot and cook for 5 minutes. Add the stock to the pot and the seafood. Bring to a boil. Reduce the heat to a simmer and cook for 30 minutes. If the potatoes are tender, stir in the cream and mash lightly. Season with fleur de sel and freshly ground pepper. Stir in the fresh parsley before serving. 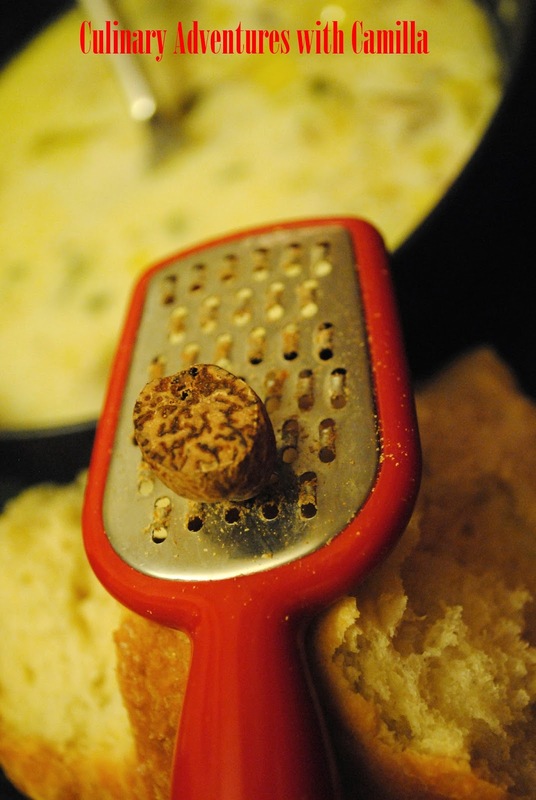 Serve with a sprinkling of freshly grated nutmeg. For the bread...I love that this is a fairly quick yeast bread, with only two rises that equal one hour. It has a tender bite and a crisp exterior. We love it. Place the salt, flour, and yeast in a large mixing bowl and slowly add warm water, mixing continually until the mixture forms a stiff dough, add more flour until you have a dough stiff enough to knead. 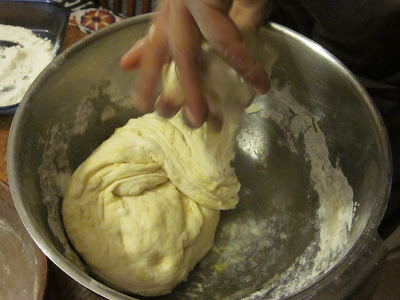 Lightly flour the work surface, and knead dough for 10 minutes until it is smooth and elastic, then place in a greased bowl. Now place bowl in a warm place for 40 minutes until it has doubled in size. 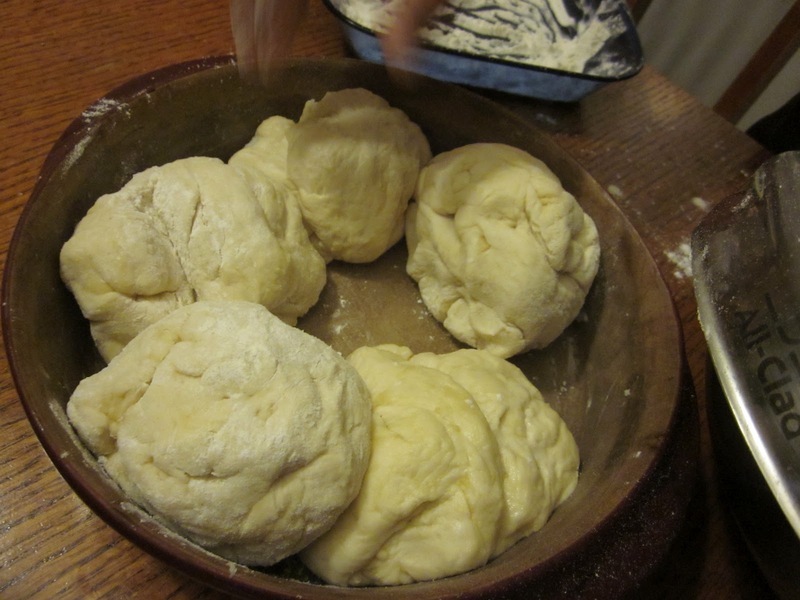 Roll dough into fist-sized balls and place in a greased baking dish. Sprinkle with more salt then let rise for another 20 minutes or, again, until the dough has doubled in size. Place in the oven and bake for 25-30 minutes until rolls are golden brown and sound hollow when tapped. Today my Spice It Up! kiddos and I traveled, via tabletop, to the Moluccas. 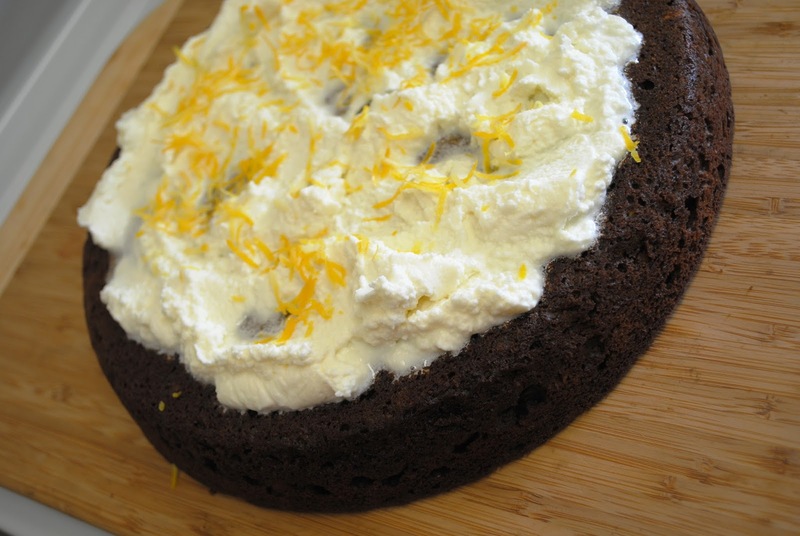 We looked at nutmeg, mace, cloves, and pepper...and we baked Piernik, a gingerbread cake from Poland. I employed a new strategy: I put all of the steps - measurements required, mixing, etc. - on pieces of paper and had each student pick one. That was their task. If they finished, and there were still more tasks to complete, they could pick another. This alleviated the constant barage of 'What can I do?! 's that I had last week. Anything that reduces my stress level in directing a dozen kids to make a single dish is a good thing. Some kids ground mace. Other ground nutmeg. Some measured sugar. And others whipped the cream to finish the cake. Good teamwork! Preheat oven to 350°. Coat pan with vegetable oil. Line bottom with parchment paper; spray paper with oil. Whisk flour, baking powder, baking soda and spices together in a medium bowl. Place butter in a large bowl. Pour 1/2 cup boiling water over and whisk until melted. Whisk in sugar, molasses, egg, and fresh ginger. Add dry ingredients; blend with a spatula. Transfer to prepared pan. Bake until tester inserted into center of cake comes out clean - 30 to 35 minutes. Cool in pan for 10 minutes. Invert and remove parchment. Beat cream and sugar in a medium bowl until firm peaks form. Spread over cake. 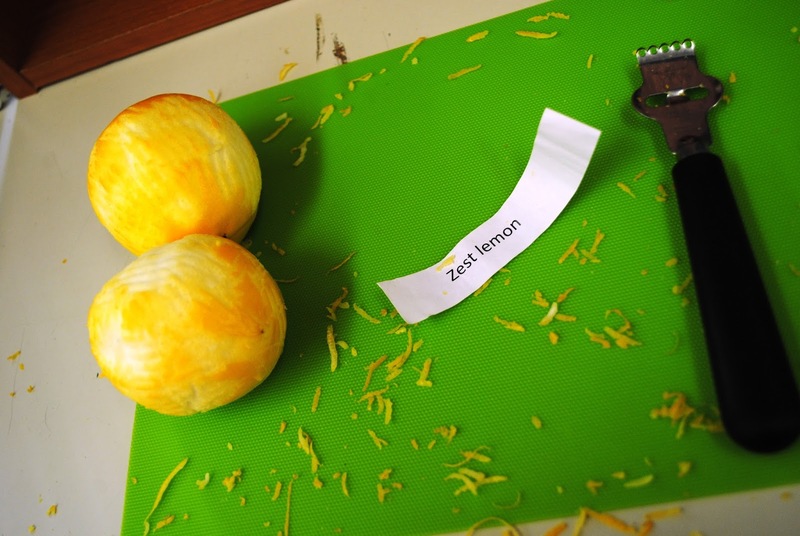 Garnish with zest. Some of the comments: "Wow, this tastes good...even though there is no chocolate in it." Can I take some home to my mom and dad?!? "This tastes like the holidays." One thing - I didn't get to try it! I guess I'll have to make another cake this weekend...just to try it. It smelled amazing. But, I am a gingerbread fanatic. Case in point: not only did we bake the piernik, I also brought in honningkagehjerter (Danish gingerbread cookies). This month the Pass the Cookbook crew - under the leadership of Kita, the culinary force behind Pass the Sushi - is cooking from Christiane's pick. 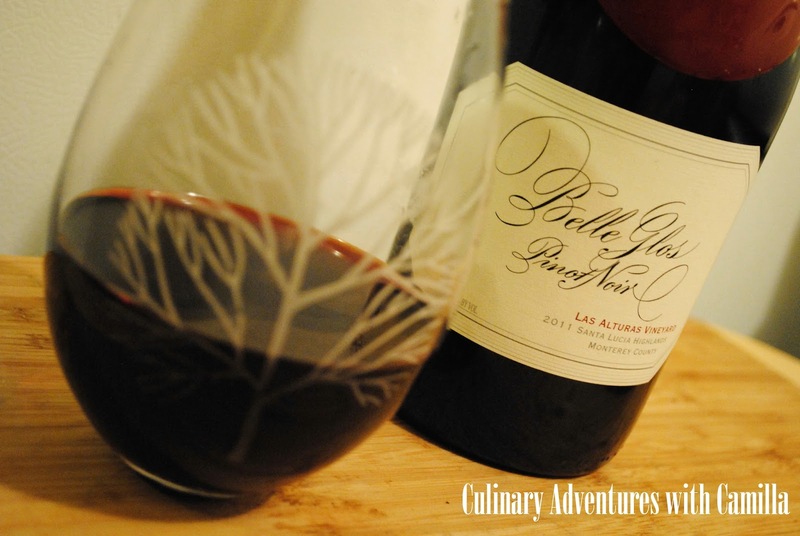 Christiane blogs at The Mom Chef: Taking on Magazines and chose Sheila Lukins, Julee Rosso, and Sarah Leah Chase's Silver Palate Good Times Cookbook for this month. As always, we had the choice of three recipes. Our choices this round: Seafood Lasagna, White Chocolate Mousse with Frangelico, and Vegetable Pot Pie. I thought about making combining two of our choices into seafood pot pies, but went with the lasagna. Even though I just made Lasagna alla Puttanesca for our last Pass the Cookbook reveal, in November, I decided to venture down the lasagna path again because this one: (1) involves seafood and (2) includes an anise-flavored liqueur. Ummm...yum. I'm always in when ouzo, sambuca, or their cousins are involved. The original recipe calls for Pernod. 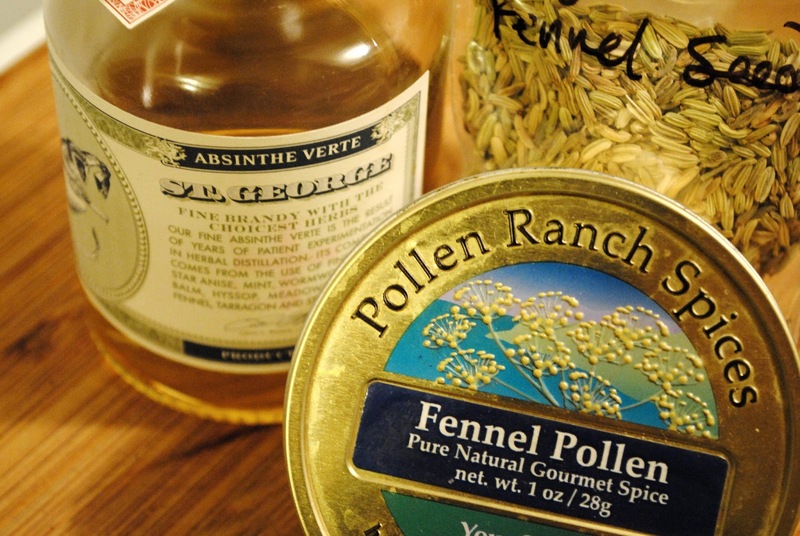 I had St. George absinthe; so, I went with that and added in fennel bulb, fennel pollen, and fennel seeds for that extra licorice-y goodness. 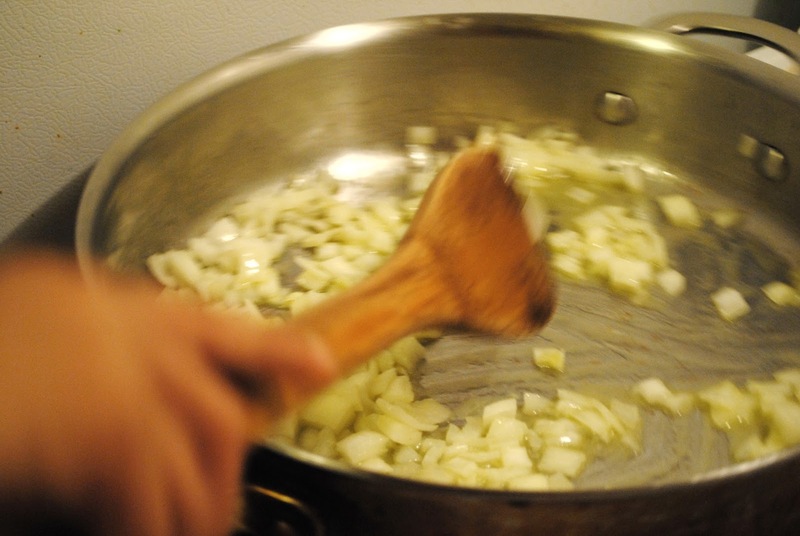 Meanwhile, combine the oil, leek, and fennel in large, flat-bottom pan and cook over medium heat, stirring, until fennel is lightly browned, about 5 minutes. Add the seafood and cook until opaque. Stir in the tomato sauce and cook, stirring, for about 3 minutes. Remove from heat. Stir in the spinach, parsley, fennel seeds, anise seeds, and fennel pollen. Stir till the spinach is wilted. Splash in the absinthe. 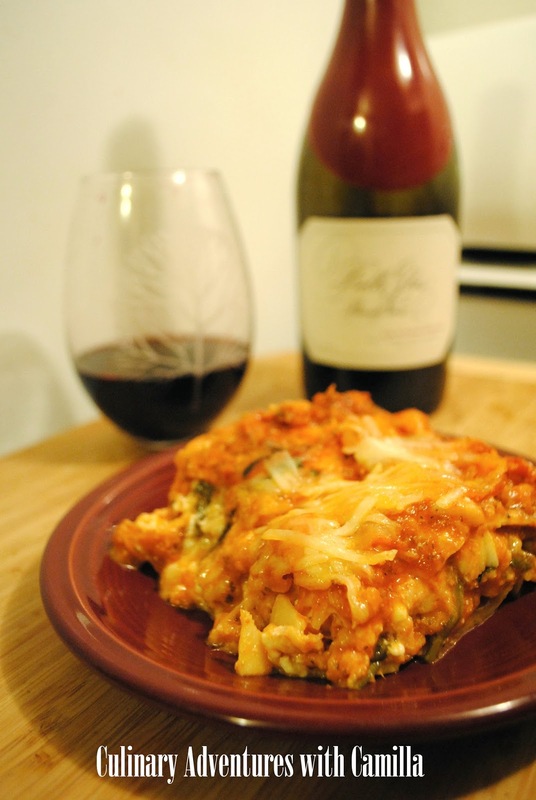 In a large baking dish, layer: sauce, pasta, cheeses. Sauce, pasta, cheeses. Repeat until your dish is full or you're out of ingredients. Cover with foil. Preheat your oven to 350 degrees. Bake for an hour - or until the sauce is bubbling and the cheese is melted. Uncover and cook for an additional 10 minutes. Bake the lasagna until bubbling and browned, about 50 minutes. Let stand for 10 minutes before serving. Jake and I uncorked one of our Christmas presents to go with the lasagna. Cin cin. This was a great glass of pinot...and a great lasagna. I will definitely be making this again. Dylan asserted, "Mommy, this is the best lasagna ever!" And he didn't even get to have the Belle Glos with it. Debra from Eliot's Eats is hosting this month's Food'N'Flix. And we are going back to the mid-80s with The Breakfast Club. Click to see her invitation. When it comes to 80s movies, there are two prevailing genres: slasher films and coming-of-age comedies. Think Sixteen Candles, Pretty in Pink, Some Kind of Wonderful, Ferris Bueller's Day Off, and The Breakfast Club...all of which were creations of the late John Hughes. I was coming of age in the mid-80s - learning to drive, first kisses, etc. - so I probably watched all of the movies in the latter genre; I wasn't much for horror flicks. The premise is pretty formulaic: put a bunch of people in a room and see what happens. Even the characters are ridiculously stereotypical. There's "a brain, an athlete, a basket case, a princess, and a criminal." But the movie is genius in leveling the field. No matter how different they all appear at the onset, they all suffer from the same problems. Like most teenagers, none of them communicate well with their parents, each feels tremendous pressure from their peers, and all are angst-ridden about their future. Remember those years?! In The Breakfast Club, Hughes created a surprisingly enduring film that is still funny almost 30 years after its theatrical debut. "You won't accept a guys tongue in your mouth and you're gonna eat that?" Bender heckled her. There was Allison's Pixie Stick-Sugar-Cap'n Crunch sandwiches. But...well...yuck! I'm a food snob. Then I thought about what makes me smile at breakfast time. Coffee! Eureka. I decided to make it all the way from green bean to cup o' joe. And, unlike, Mr. Vernon I'm careful to keep my coffee in my mug...and not all over my desk. 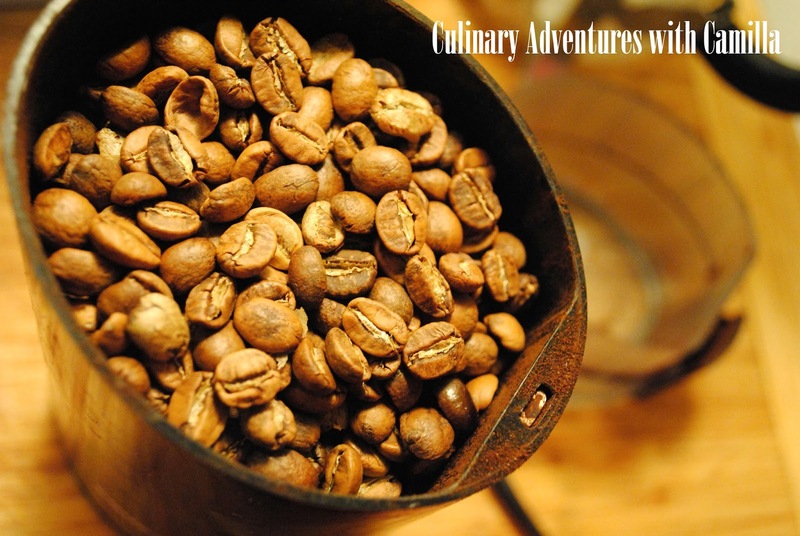 Home-roasted coffee starts with the green beans. Add heat and agitation. 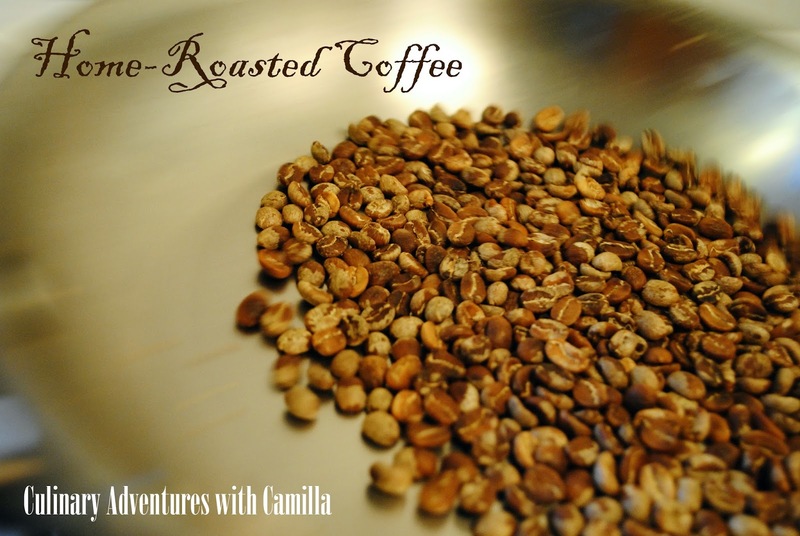 When I took a quick coffee-roasting lesson, we used a roaster. But, at home, I just used my skillet. It worked great. It took some patience...and I only set off the smoke alarm twice! 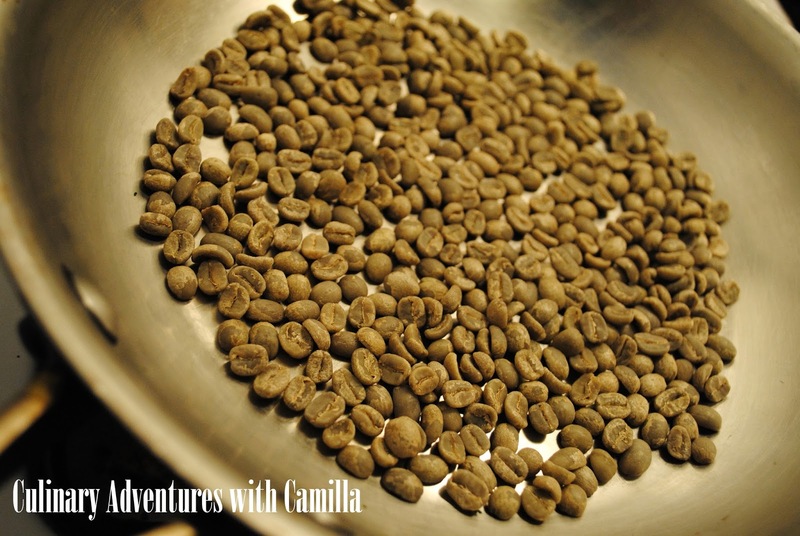 When you roast coffee, and you're using good beans, do a light roast. That way you can actually taste the characteristics of the bean. Dark roasting homogenizes the flavor. A dark roasted bean of good quality tastes exactly the same as a dark roasted bean of mediocre quality. 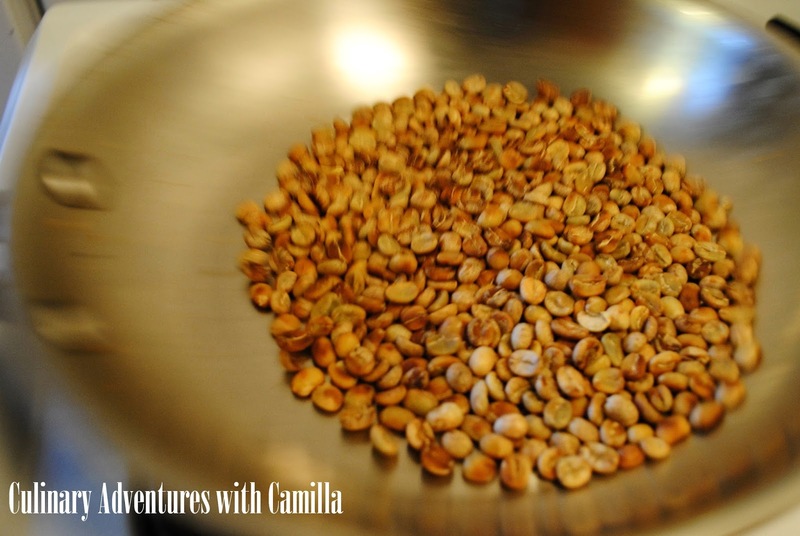 Grind your beans. Only grind what you plan to use. 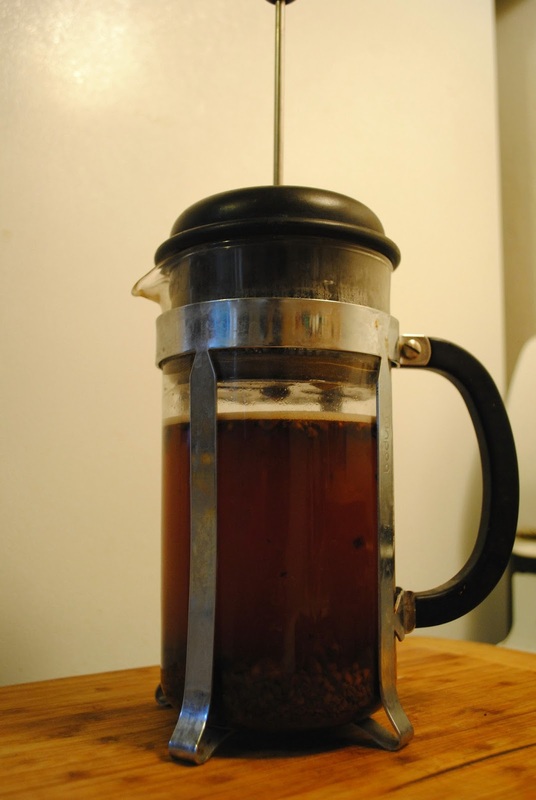 I decided to use my French press. I use 2 T ground coffee per cup. I take the kettle off the stove right before it boils. I think I read somewhere that you want your water at 205 degrees. I'm never that precise. Pour your water over the grinds, cover, and let steep. Steep for 4 minutes, then press the plunger down. For me, I love my coffee black. 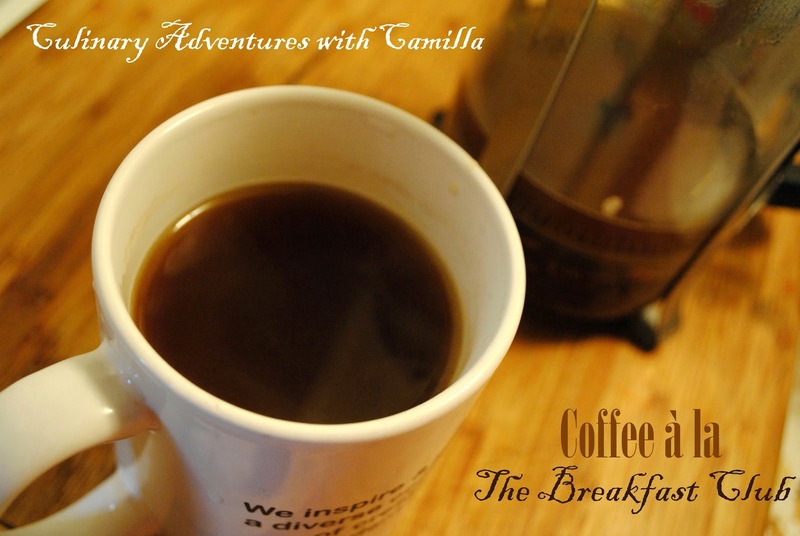 That way I can taste the beans, whether they are fruity, citrusy, or nutty...I just love the taste of coffee. How do you like your coffee? If you want to join the fun, you still have a bit of time. Submissions are due to Debra by January 27th. And next month, I'm hosting! Join us in watching and cooking from Babette's Feast. Check back for my invitation on February 1st.